Insurance, in any form, is often a confusing puzzle. From deductibles and maximums, to waiting periods and frequency limits, it might seem impossible to keep it all straight! We are always available to help our patients understand and make the most out of their dental insurance benefits, but here is an intro into the dental insurance world! The two most popular and known types of dental insurance plans are PPO and HMO plans. PPO stands for “Preferred Provider Organization”, a type of program in which participating dental providers contract with an insurance company and agree to a fee schedule of payment for dental services. These fees are commonly drastically reduced fees (compared to normal office fees). In return, PPO providers are placed on that insurance company’s list of preferred providers which is then distributed to plan members. By choosing a Preferred Provider with your insurance company, you will enjoy a sizable discount on your dental procedures. While you may visit any dentist you wish, the patient is responsible for the difference between the contracted fee and the dentists office fee if the doctor you choose is not in the PPO network. Also, referrals to specialists (oral surgeon, endodontist, periodontist) are not typically required for coverage. HMO (Health Maintenance Organization) or DHMO/DMO (Dental Maintenance Organization) is a little different. These plans require the member/subscriber to choose a Primary Care Dentist (or PCD) from a list of participating providers. 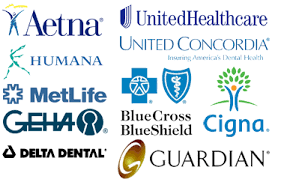 Patients will only receive primary dental coverage if they have chosen a dentist from this list and communicated their choice to the insurance company. Once you have chosen a doctor, your insurance information is sent to your dentist on a monthly list (or roster). Unlike PPO plans, you will not have coverage from an out of network dentist. Also to note, unlike the PPO plans, HMO plans require a referral to a specialist for oral surgery, periodontal treatment, endodontics and orthodontics. You may not have coverage for your appointment with a specialist if you do not bring your specialty referral to your appointment. There are certainly advantages and disadvantages to each type of plan, and only you and your family can decide what is right for you. PPO plans offer a wider option of providers you may visit and still receive coverage, and HMO plans restrict your choice to the few that participate in your plan. Co-pays, while varied, seem to be comparable with both plan types. So review your options carefully, and most importantly, make sure you are fully aware of the limitations/rules for the plan you choose. We strive to get the most information about your dental benefits from your insurance company, however some clauses, limits or exclusions may not be communicated to us. Additionally, if you or your family members don’t have any dental conditions you are aware of, avoiding dental insurance all together is growing in popularity. For the amount of coverage dental insurance offers, it isn’t always worth the price of the premium, deductible and co-pays. Some dentists (Dr. Walther included) offer a discount for self-pay patients. While you do have to pay out-of-pocket for your dental treatment, a lot of patients still come out ahead using this method. If you or your family have any questions regarding your dental insurance, please feel free to give us a call at 314-469-1950 and we would be thrilled to help you understand your options!